Booktending: The Big Snark-Off: Photo Edition! Great shots to take shots at this week. What delicious fun! 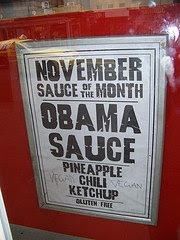 And, from the over-enthusiastic Aussie Department: Obama Sauce in Fast Food Stand, Melbourne, Australia from Free Range Librarian by K.G. Schneider (Gluten Free no less!) Crikey! Hilarious! Love the idea that any man would SMILE wearing that poncho. Perhaps it would be more convincing if he was sporting an evil "she's dead the minute her eyes are closed" grin.